(October 17, Bolingbrook, IL) – Massage Warehouse SanctuaryTM made a charitable contribution of $10,750 to the Massage Therapy Foundation during the American Massage Therapy Association (AMTA) national convention in Ft. Worth, Texas. It was Massage Warehouse Sanctuary’s largest single philanthropic donation to date. Funds for the contribution came from corporate partners as well as donations in the form of prize raffles by recent AMTA trade show attendees. Massage Warehouse Sanctuary is the philanthropic arm of Massage Warehouse and has a long history of giving back to the massage therapy community. Massage Warehouse, the market leading supplier and one-stop shop for massage therapy professionals, is a division of Scrip Companies; a leading direct marketing and ecommerce specialty distributor serving the Massage Therapy, Spa, Chiropractic, Physical Therapy/Rehabilitation, and Consumer Home Health and Wellness markets. Although two separate organizations, the Massage Therapy Foundation was founded by the American Massage Therapy Association (AMTA) in 1990 with the mission of advancing the profession by granting funds for research, community service, education initiatives, and conferences. 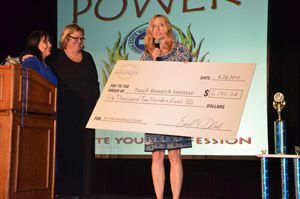 Julie Lohmeier, VP Marketing of Massage Warehouse, presents a contribution to The Touch Research Institute at the recent Florida State Massage Therapy Association (FSMTA) convention. Association President, Leiah Carr and Lynda Solien-Wolfe accepted the award on behalf of Dr. Tiffany Field. (July 8, Bolingbrook, IL) – Massage Warehouse Sanctuary™ made a charitable contribution of $6,200.00 to Tiffany Field Ph.D., Director of the Touch Research Institute, during the Florida State Massage Therapy Association (FSMTA) convention in Orlando, Florida. Funds for the donation came from corporate sponsors as well as donations in the form of prize raffle purchases by recent FSTMA trade show attendees. The Touch Research Institute is dedicated to studying the effects of touch therapy at all stages of life, from newborns to senior citizens. Studies by the Touch Research Institute have shown that touch therapy has many positive effects, including that massage therapy facilitates weight gain in preterm infants, enhances attentiveness, alleviates depressive symptoms, reduces pain, reduces stress hormones, and improves immune function.